Amanda was born in South Florida. In 2004, her parents relocated the family to Ocala to enjoy country life and get out of the big city. Growing up, Amanda was always out riding. 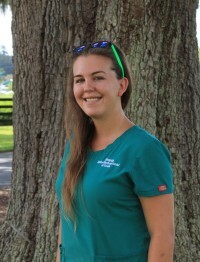 At 18, Amanda got her first farm job at Summerfield Sales Agency as a groomer to thoroughbred weanlings. Within a year, she became the assistant manager of the broodmare barn. She enjoyed working there for 4 years before taking off to be a full time mom. Amanda joined the EMCO team in April of 2014. She loves working with mares and foals. She enjoys guiding the foals into the world and then watching them grow and learn each day. In her spare time, she likes spending time with her husband Matt and their sons Conner and Mason. As a family, they enjoy fishing, hunting, and dirt truck racing in Ocala.